An infection with the dangerous GandCrab 5.1.5 ransomware virus leads to serious security issues. With our removal guide, victims can try to restore and protect their computers. In case that your Mac has been affected by GandCrab 5.1.5 or you suspect that other threats are running on it you can follow detailed instructions on how to detect and remove Mac viruses so you can keep the device clean and secure. GandCrab 5.1.5 virus is a new data locker ransomware that has been released in attack campaigns against computer users worldwide. The threat could be utilizing widely used tactics of distribution to infect computer systems. The GandCrab 5.1.5 is a newly discovered strain of the malware family. It has been detected in a limited test release which probably signals that forthcoming infections are going to target specific countries. So far the acquired samples have been detected in a limited test run indicating the the real attacks might use different tactics. A main method used by the malicious actor behind GandCrab 5.1.5 is the coordination of SPAM email messages — they are used to spread the threats by sending out messages that pose as legitimate notifications sent by popular Internet portals or services that the targets may use. The virus files can be either directly attached or linked in the body. They can also be uploaded to fake download sites which are designed to appear like any of the popular Internet portals or vendor download sites. The malicious actors may use similar sounding domain names, certificates and hijacked design and contents to coerce the victims into thinking that they are accessing the legitimate address. Another way that the threat may spread is through infected payloads — the use of various files that are infected with virus code. A popular example is the malicious document which can take any form: presentations, rich text files, spreadsheets and databases. Once they are opened by the victims a notification message will pop-up asking the target users to enable the built-in scripts. If this is done the virus infection will follow. The other popular technique is the inclusion of the code in application installers. They are malicious copies of legitimate setup files of popular end user programs that have been modified with the GandCrab 5.1.5 ransomware code. Ransomware files are also popularly spread by fake user profiles — they can post to community forums or social media accounts. The criminals can utilize both fake or stolen identities to increase the number of infected user. In certain cases the criminals may also be distributed via malicious browser plugins — additions to the most popular web browsers that are advertised as useful. The plugins are uploaded to the official repositories and often make use of fake or hijacked user reviews and developer credentials. Once they are installed by the users they will execute their built-in instructions that in many cases leads to the GandCrab 5.1.5 ransomware virus infection in the end. The GandCrab 5.1.5 ransomware is a new sample of this malware family which has been found to follow the execution patterns of the samples preceding it. By being distributed using the same methods and having an almost the same behavior when running we can deduce that only minor changes have been implemented across the versions of GandCrab. As soon as the infection is made the engine will install the ransomware as a persistent infection which is done by modifying key operating system areas: configuration files, boot options and the Windows Registry. As a consequence the virus will be launched every time the computer starts. Additionally most of the manual user removal settings will not work properly. In combination with this module a security bypass procedure will be started. It will search for security services and software that can block the virus installation. This is done in order to protect the ransomware from being discovered and removed. Specific instructions have been added to this sample that will check the running host and determine if it is a real computer or a virtual machine instance. This shows whether or not the ransomware is being analyzed by malware researchers. By detecting the presence of such environments the virus can block a variety of tools used to isolate them from the machines. Personal Data — The ransomware can hijack information that can directly expose their identities: their name, address, phone number, location and account credentials. The analysis shows that the engine is capable of scanning the contents of application data used by browser hijackers. Machine Metrics — The malicious engine will hijack information that is used to construct an unique infection ID which is made by using the following input values: installed hardware components, user settings, regional preferences and operating system environment values. As a result each individual machine can be distinguished by looking at the computed ID. When these two modules have finished running the GandCrab 5.1.5 ransomware will have complete access to the operating system. The typical changes will be applied to the Windows Registry wherein strings belonging both to the system and the user software will be modified. For the users this will lead to troubles when launching certain functions of the victim programs. When the operating system values are modified the users may experience serious performance and stability problems. Its important to note that this particular sample is capable of hijacking information stored by user-installed applications like web browsers. When all information has been retrieved a Trojan client will be activated. It will establish a secure connection to a hacker-controlled server, the GandCrab ransomware family will use a service located on the TOR anonymous network. This makes it very difficult to track the network stream as it is encrypted and passed through other hosts. Infections like this one may also be used to spread other threats to the infected machines. Such scenarios are common when advanced attacks are being planned. The reason for this is because the GandCrab 5.1.5 ransomware has already bypassed the security elements found on the infected machines and the distributed payloads it may carry will be able to deploy themselves without any trouble. An example of such a payload is the cryptocurrency miner, a small application that will download complex mathematical tasks from a server in a sequence and run them. They will have a heavy toll on the performance and stability of the infected computers by taking advantage of the most important resources: CPU, GPU, memory and hard disk space. The processed files will receive a randomly generated extension. The ransomware note will be created in multiple text files and also designate itself as the desktop wallpaper. Please note that paying the requested ransom fee to cyber criminals does not really solve your problem with GandCrab 5.1.5 crypto virus. In fact, you only encourage hackers to continue spreading ransomware of this kind. Instead, you must remove the threat immediately, and only then look for optional ways to recover your data. WARNING! 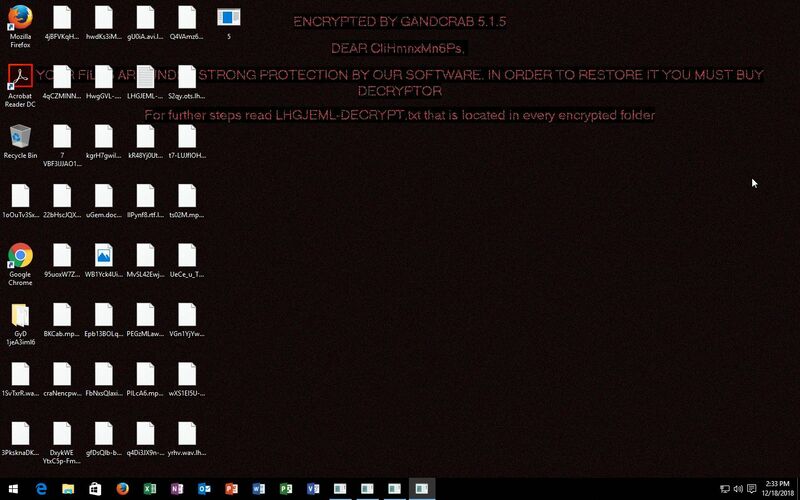 Manual removal of GandCrab 5.1.5 ransomware virus requires being familiar with system files and registries. Removing important data accidentally can lead to permanent system damage. If you don’t feel comfortable with manual instructions, download a powerful anti-malware tool that will scan your system for malware and clean it safely for you. WARNING! All files and objects associated with GandCrab 5.1.5 ransomware virus should be removed from the infected PC before any data recovery attempts. Otherwise the virus may encrypt restored files. Furthermore, a backup of all encrypted files stored on external media is highly recommendable.